You’ve served on the RCF board and now the Rushford Peterson School Foundation board. What do you enjoy about this element of service? I feel fortunate for the opportunity to work with a diverse group of community members that also have a passion to give back to the community. The biggest misconception for me has been that sometimes when you think there is not enough money to make a difference, you come to realize the money is only a small part of the work. Why do you feel having a community foundation is important to your community? Any favorite projects? Specifically in Rushford area, due to the 2007 Flood, we were fortunate that a group of forward-thinking citizens worked with SMIF to establish RCF in the late 1990’s. RCF and our relationship with SMIF was a catalyst for recovery funds and more importantly there was an established board of directors ready to take on the challenges our community and residents were facing. Currently, the Foundation for Rushford – Peterson Schools is hosting an annual event called the Tri-City Challenge and our hope is to grow this event to a large regional event to promote the area, our three cities, community fitness and raise funds for scholarships. We are confident our area is perfect for this type of event and now in our third year we’ve learned each year how to improve our event. What do you remember about the 2007 floods? What was the partnership like between RCF and Southern Minnesota Initiative Foundation during this time? Jennifer Nelson of SMIF attended one of our first special meetings of the RCF board following the flood. From that point we met often and had communications with SMIF via email and phone as opportunities and challenges came our way. As I look back, it felt like a very organized approach to finding the unmet needs and funding them or supporting them if people or information was more important than the money. Many times it was. Of course, we remember and thank SMIF for organizing and quickly granting the FIRST funds to Rushford area businesses to begin the rebuilding process. We reopened the grocery store on Halloween Day, October 2007. The day Tim Penny stood in our rebuilt store to recognize the effort was an important milestone for our company. How long did it take the community to recover? The recovery process continues even today. I’m certain a community never fully recovers from an event like this, but instead is changed because of it. It is difficult to assess the financial health of residents who either lost their home in the flood or had extensive damage. Some businesses were not able to come back after the flood, but the majority did and have been able to get reestablished and even have some growth. Why have you chosen to stay in the Rushford area and Minnesota? I enjoy the benefits of living in a small community where you know everyone and we have almost everything you need right here. We chose to raise our family here, in a caring community with strong school district and many activities for our children to be involved in. My goal of owning and operating a business was also a main reason to stay in the community that I grew up in. 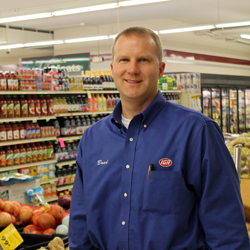 Our family has been in the grocery business in southeastern Minnesota for over 40 years. You and your father are now donors of the Foundation. What led you to want to support the work of SMIF? SMIF is doing in our area is impactful. The strategies of SMIF line up well with what we’ve contributed to on a smaller scale in the communities we serve. We’ve been impressed with the strategies and the data gathered to make sure the funding is meeting targeted goals. We appreciate the work SMIF does in Rushford and the service area of southeastern Minnesota.